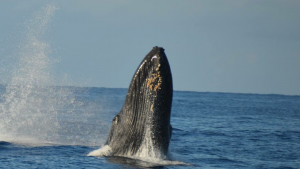 We operated a Wake up with the Whales Cruise and our Signature Whale Watch Cruise on Thursday. The first cruise departed from Anaeho’omalu Bay, and the second from Kawaihae Harbor. And though we scoured the coastline, we didn’t see Humpbacks on either cruise — we know there are still some whales around, because we could hear them singing through our hydrophones. But “hearing” isn’t “seeing”, so we called each of our trips a “Fluke” and invited all of our guests from both cruises to join us again for FREE! Have a great weekend! I’ll send out our next update on Monday. Ocean Sports Whale Fact of the Day: The barnacles called “Coronula diadema” live only on Humpback Whales, and they seem to prefer to live on areas of the whale where the water flow is consistent (chin and fins). Though researchers aren’t sure how the barnacle can even find a whale to live on, there is some speculation that because the barnacles are spawning during the winter in Hawaii, the whales here are swimming in “barnacle larvae soup”. When a whale swims by, those “baby” barnacles chemically sense it, and hop on where ever they can. They use their antennae as “feet’ and walk around the whale till they find a suitable spot (which can take quite a while… (if the barnacle were the size of a person, the whale would be 20 miles long). Once they find a spot they like, they flip over and produce tube-shaped cavities in their shells that actually draw in prongs of growing whale skin, holding their position on the whale for life.